Hi Pavel…I, I thought I’d start with an introduction to our process. 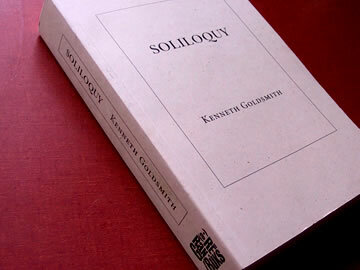 Um, we are using the form of a conversation to explore Kenneth Goldsmith’s work ‘Soliloquy’, from 1997. We do this consciously, utilising, Jacques Derrida’s methodology to unsettle the usual relations between the literary work and the critical text. Derrida didn’t just respond to James Joyce’s Ulysses in his text from 1987, his writing was partly like it. His analysis was a creative work, which shared in Joyce’s project and borrowed its literary devices. We are not just responding to Kenneth Goldsmith’s Soliloquy, our process is partly like it. Our analysis is a creative work, which shares Goldsmith’s project and borrows its terms of construction. I’m interested in the idea of creating work through conversation. As the artist Terry Atkinson said when reflecting upon the early work of Art & Language “The communal studios, the refectories, the seminar rooms, the vestibules, the corridors, the libraries of the art schools was where the work got made and it was generally made in conversation and writing – but mostly in conversation.” So we’re constructing a text, um, through conversation. I’m on the phone in York and you’re on the phone in Manchester. Both us are videotaping ourselves on the telephone. The intention being to transpose each person’s conversation and to position it at either end of Goldsmith’s ‘Soliloquy’ so that the reader can only ever read one half of the dialogue between us. Definitely…um, I mean I-I come to a quote later that talks about a few people, um, that are referring to Kenny’s work have the chutzpah they say to actually expose themselves to such an unedited state of undress…and I kind of felt, um…I suddenly realised that obviously I don’t have the chutzpah to expose myself to that sort of unedited state of undress but I’m asking you to provide uh…t-t-t, to play that role with us. Yeah. Right, o.k. well, um, uh-uh, I’ve got an argument that I wanted to run past you and see if I can gauge your responses to this argument that I’ve put forward…there’s three parts to the argument. So if I run through part one and then-then-then see what you say, yeah? Um…through my research into Goldsmith’s practice I’ve come up with three parts to an argument which I’d like to run past you. I’m going to suggest that Goldsmith’s work disrupts the classic binary oppositions: speech and writing; absence and presence; and order and chance. The first subversion occurs in relation to speech and writing. From Plato to Saussure speech was seen to be privileged over writing. The privileging of speech over writing was initially premised on the idea of a hierarchical chain from thought to speech to writing. The two forms of communication were posited in a classic binary opposition to one another. Derrida and others working around theories of deconstruction have disrupted the rigidity of binary oppositions. Derrida talks about how speech is connected to presence and I’ve got a quote on that, um…He says that “when I speak, I am conscious of being present for what I think, but also of keeping as close possible to my thought a signifying substance, a sound carried by my breath…I hear this as soon as I emit it. It seems to depend only on my pure and free spontaneity, requiring the use of no instrument, no accessory, no force taken from the world. This signifying substance, this sound, seems to unite with my thought…so that the sound (seem) seems to erase itself, become transparent…allowing the concept to present itself as what it is, referring to nothing other than its presence.” He then goes on to discuss, um writing - how it operates on absence: “The written marks are abandoned, cut off from the writer, yet they continue to produce effects beyond their presence and beyond the present actuality of their meaning, i.e., beyond their life itself. To write is to produce a mark which will constitute a kind of machine that is in turn productive…The writer’s disappearance will not prevent it functioning.” But I, I’m proposing that Goldsmith’s 183,685 word text Soliloquy is neither speech nor writing but is what Derrida would term an undecidable. I would call it, ah…WRITTEN SPEECH, something in between speech and writing. In Lacanian terms, there are two levels of language, announced which has been written and is dead and announcing which incorporates the process of speech. The WRITTEN SPEECH in Goldsmith’s work is being written through the process of announcing. The writing is the process. Gordon Tapper said in his review of Goldsmith’s ‘Soliloquy’: “Every writer’s guilty fantasy may be to write as effortlessly as one speaks, but few have the chutzpah to actually expose themselves in such an unedited state of (of) undress.” And this is not written from experience, I-I think his text is written experience. Written speech as an undecidable allows the play of possibilities, the movement back and forth, into and out of the opposites. Its not like reported speech which may be taken out of one context and framed in a totally separate context, in a text or in an essay which will suggest further meanings. Goldsmith’s speech is extracted from the context of the dialogue (the voice of the other has been erased) but remains in the original context of his speech, in time and sequence - in a continuous unedited stream from Monday morning through to Sunday night. His speech is the context and the context is his speech. So, that’s kind of part one…um. Yes. Well, this is um, yeah, this is, this is, this is another part, it’s part two…it comes on nicely from what you’ve been saying it-it’s the idea that Goldsmith is both present and absent in his work, um there’s another undecidable that occurs in relation to the binary opposition of presence and absence. Um, it can be seen as a haunting speech. Writing is usually the death of presence and the possibility of absence but Goldsmith appears to have exchanged his memory for the mechanical recording device. Instead of more artificial exercises in stream of consciousness writing, the very rigour of his method must mean that he can’t retain critical distance from his speech throughout the entire week and those moments of slippage are what gives the writing it’s live currency. I-I discussed this…Kenny’s Soliloquy with two friends of mine, both of whom work with the ideas of the psychoanalyst Jacques Lacan. The Lacanians (as I shall refer to them from now) suggested that Goldsmith is absent from his own text, that Goldsmith’s text circumscribes his own absence as a subject of the signifier – by mapping himself on the level of the signifier (or language) he draws the rim of what is specific to his own lack so that the object a becomes a logical (but missing) deduction from the text. The text represents the lack/ the absence specific to his subjectivity. However, there may be moments of vacillation where the unconscious through slippages, parapraxis etc indicates a hole in the symbolic/a dynamic unconscious - the subject emerges at the very moment of his extinction. Um, they also suggested that his soliloquy is similar to an analytical session to the extent that the logic that produces it is formed by a subjective structure – nothing is edited out, it has no purpose. However, it is not an analytical session as there is no analyst and hence no punctuation. By recording for such a long period of time, Goldsmith is almost operating a scientific methodology, capturing everything he can say, so that he can circumscribe the missing bit, the bit that cannot be said. The unconscious emerges in Goldsmith’s written speech as something behind the slip of the tongue, something that comes out when the slip of the tongue occurs. The dialogue of others being left out of the work could be seen as a metaphor for Goldsmith’s own division in the hands of the signifier. So Goldsmith himself is absent but becomes present through the repeated holes in language, um, the slippages that present an eruption of the real. The slippages include all the fumbled bits, the spaces that cur – that occur on the edge of language. And I guess that’s um, my second question or maybe my second statement or second part…Well, it’s not really a question, yeah, I’d–I’d agree. Yep. Right. Yes. Yes. Yes. Right. Yeah. I mean. Yes. That, that’s very interesting so-so your feeling…so you actually feel the absence left by the person he was originally having the dialogue with that was obviously erased. Yeah. Yes. Yes, definitely, yeah. It’s definitely located in the everyday, yeah. Yeah. Right, and you get to know different characters. Yeah. Yes. Oh yeah, yeah. Right. Right. Yes. But, I - I think you actually configure it mentally, which is-which is why, I-I actually, I actually think there is this part where the other is both present and absent as well…well, yeah…Yes. Yes. Yes. Right. Yes, so it is this combination of, it-it is both present and absent – I mean I-I-I I located it with something, um, ah fairly – fairly similar…n-n-n-not a film but I could say Goldsmith is both present and absent and the voices of the other people he spoke to during his one week recording are both present and absent. The voice of the other remains strongly present through its supposed absence. Their dialogue has been erased and so is absent formally in the text but present in relation to the construction of his speech where their absence makes their presence stronger. And-and I like the way you said you could almost fit yourself in-in-in the place of the people he was talking to…Yeah. Oh yes, yeah. Yes. Right. Yes. Well, I…Yeah. Right. Yes. Oh, this, this links to…yeah. Yeah. Yeah. Well, well that links to exactly what I was thinking, the analogy I had was this operates in much the same way as the British artist, Rachael Whiteread’s ‘House’ from 1993 in which the interior negative space of an ordinary Victorian, terraced East London house was filled with liquid concrete…right…o.k. Right. Oh, right…yeah. Well-well I-I think you’ve picked up on something that is very , very good is-is that he’s, um, he’s very much…it’s a very strong idea that he was trained as a sculptor…I mean he said about, um...Goldsmith registered this shift from the invisible to the visible in relation to his own art practice in an interview with Erik Belgum where he says: “I wanted to see how much one week of my speech weighed. I’m interested in concretizing the ephemeral; and there’s nothing both more concrete, yet ephemeral, than language.” Yeah. Yeah. Yes. Right. I-I-I was yeah. Right. Yeah. I-I like very much what you said about the group in Zagreb who wanted to concrete the inside of their heads, I’ve just taken a book…What, yeah, yeah. Yeah. Right. Right. Yes, yes. Yes, I-I-I-I’m totally with you there… I I’m going to claw myself back to – back to, b-b-back to this thing you said about the group in Zagreb…because I’ve just taken a book off my shelf so – so I’m going away from my structure. But I’ve - I found this quote that I find particularly interesting – I’ll just read this little section out to you…um, it’s from William H. Ewing’s…the book’s called ‘The Body’…he said in the introduction: “Extravagant claims were made of photomicrography when it was invented. Just as in the seventeenth century, when mechanistically minded observers ‘saw’ minute machine-like structures through the microscope, so certain photography enthusiasts ‘saw’ structures that they were predisposed to see. A particularly outlandish discovery was reported in Photographic News in 1888 by George R. Rockwood of New York, under the rubric, ‘a photo-physiological theory’. Examining photomicrographs of brain tissues, he was astonished to find markings which seemed to him to be suspiciously like Chinese characters (note the lure of the exotic East) or hieroglyphs. Amazed by this monumental find of ‘pictures in the brain’, Rockwood speculated that ‘future literary executors shall be able to extract from the distinguished dead posthumous poems, suppressed opinions, the contents of ‘burned’ letters, family secrets, or the mysteries of life that are buried.” Which I thought was quite a, quite a nice idea. Right. Well, th-this-this relates to…what he says about John Cage. He said: “ If something is boring after two minutes, try it for four. If still boring, then eight. Then sixteen. Then thirty-two. Eventually one discovers that it is not boring at all.” And that-that was one of the quotes that Kenny likes to reference…yeah…yeah. Yes. Yeah. Yeah. Yes. Yes, yes. Yeah, he, I mean he…yeah. Yeah. Right. Right. Well, I mean…the-the, the-the, the third part of my argument I had was, was that structure and chance are also…which I think we’ve been talking about in the process of this actual conversation itself, um, that structure and chance are supposed to co-exist within Soliloquy or what the dadaists called chance and anti-chance, and saying like the yes and the no - they belong together. Um, it-it, it also reminded me of another art work - one of Hans Arp’s working processes when he would take an unsuccessful drawing, tear it up and let the pieces flutter to the floor. Um, he would then dis-discover new meanings through the chance juxtapositions, the surprising configurations – and I see those fluttering pieces very much like, er, you were talking about Kenny’s snowflakes or-or Kenny’s words as snowflakes. Um-Golds…Oh yes, yeah from-from the back cover, yeah, yeah, no, uh…Goldsmith is sculpting with words and acknowledges the co-presence of contradictory elements like deliberation and randomness in his practice. In conversation with A.S. Bessa he refers to the process in no.111 as: “both an aleatory and a highly structured process.” And the same could be said for Soliloquy. Certain appointments had been fixed in the week Soliloquy was recorded such as Goldsmith’s meeting with the literary critic Marjorie Perloff in the members lounge of the Museum of Modern Art and certain routines structure the process of daily living and will be repeated through habit. Um, these represent an established order but the conversations themselves afford the element of chance. Dialogues are fluid and you can’t completely control or anticipate the direction they are going to take. In the same way our text here, our dialogue on the phone is a process that incorporates both structure and chance. Yeah. Right. Yeah. Yeah. So he’s almost like, he’s almost like a genre for a movie, like as we anticipate it’s going to be a horror film – so we expect certain things to happen in a horror film where we anticipate a period drama we expect…as we go in the cinema yeah. Yes, yeah. And-and the fact he’s in New York as well. Right. Right. Um. Yeah. Yeah, I-I, uh, yeah. Yeah, I very much see that, and I also like what you were saying earlier about, um, about-about the fact that the other person, the-the missing people…you can almost like in a cinematic way, you can exercise sort of various fantasies of the self, you can almost imagine yourself as his wife or you can imagine yourself…or as his friend. Well, I don’t mean actually as his wife…I mean as, as the dialogue of his wife so you can sort of fit yourself into all the different positions in the text…just like you might in the cinema, when you see Titanic or something, you might actually be able to identify with more than one character and both male and female, you can move between hero and villain, you can move between lots of different people, yeah. Yeah. Right. Yeah. Right. Yes, yes, yes. Yes. Yeah. Right. Yeah. Right. But there is something…yeah…there is something interesting about-about-about the process that we are going through…you know, going back to the fact that-that, that our dialogue is-is this mixture of-of myself having prepared it… I feel whilst I’m actually talking to you now that-that having researched his work carefully and presenting careful, structured arguments, which are…a lot of which I’m actually reading out, um…it’s interesting that I’m actually starting to feel more distanced from the text and you sound like, having just read and engaged with the actual book itself, rather than actually doing it as a research procedure sound like you’re actually much more involved with the text so I feel like I’ve almost created a distance for myself from the actual text as well. Yeah. Yeah. Yeah. Yes. Um. Yeah. Yeah. It-it, it might actually further distance myself from it. Yeah. Yeah. Yes. Yes, yes. Right, right. Yeah. Well, well. Yeah. Could you, could you feel - what I’m really suggesting is that it is actually it could be seen as a work of deconstruction, in the sense that it-it, it is not one thing or the other - it is always caught in this kind of space inbetween, I mean Marj…Yeah. Yeah. Yeah. Yeah. Yes. Um. Right, yes. Yeah. Right. Well, I mean, yeah I mean , yeah. Yeah, it-it, yeah. Oh, I definitely think so, the-the literary critic Marjorie Perloff when she was describing his work she said it’s “on the borders between ‘poetry’ and ‘prose’ and, more courageously, between poetry and ‘not poetry’, not to mention the borders between ‘literature’ and ‘art’.” So, it always seems to be in between these two…in between these two spaces, between - I like what you just said, between nothing or something. Um, uh-uh-uh…if you follow my suggestion as a work of deconstruction, that subverts, challenges and questions traditional positions, um, Kenny’s work which he terms EXTREME WRITING, I like that, he’s taken it from you know, extreme sports…he calls it extreme writing opens up new possibilities for language. As Goldsmith said himself in conversation with A.S. Bessa: “The less transparent language becomes on a regular basis, the more sensitized we become to its formal and physical qualities. We start to pay attention to the concreteness of language, instead of taking it for granted as a commodity, a unique medium for exchange. Through this process, language becomes more curious and valuable in and of itself.” Which I think is, uhh…Yeah, yeah. Ha, ha, that’s o.k. Mm, Yes. Yes, yes. Yeah. Yes. Yes. Right, right. Well, I-I, I’ll tell you something else I-I did because I think this connects with what you’re saying of those multiple voices that we’re kind of picking on here as well and-and-and and drawing from I mean Kenny, Kenny talks about it being, ummm…talks about sampling, I mean he’s very much into the sort of contemporary culture that we sample from all sorts of places - he talks about appropriation, and um, particularly people like Duchamp and, and he-he, he can’t believe that Sherrie Levine style appropriation strategies haven’t been mapped onto language as-as, as much or everyday language as much as he would hope. What I did, when I went through all these reviews from all these different people talking, um I actually sampled um, a lot of the phrases that caught my attention, I’ve got a little paragraph here – I-I-I hope I won’t send you to sleep with this one but its uh, these are some of the words I picked out, he said: textual landscapes, extreme process writing, the originating concept may be simple, but the end result is a complex provocation on language and visuality, the weight of language, 341 sheets of ordinary paper, refers to speech as the second most ephemeral human product - the first being thought, enormously entertaining piece of writing, inhabited by the crackling, shameless, free-wheeling voice of Kenny Goldsmith, the spatialization of words, a week of talk, he wants us to see that language occupies space and lots of it, self-imposed systems, blather, visual voices, a sculptor’s feel for the materiality of words, he makes the everyday glow with transcendence, a description of masturbation that verges on classic, disarmingly straightforward, it’s not meant to be read linearly—none of my work is, defamialirizes the everyday, and as it said in the original press release for the exhibition of Soliloquy that was held at the Bravin Post Lee gallery in New York City, February 8 to March 7 1997: By turns humiliating, enthralling, boring, tedious, absurd, absorbing, and yet always overwhelming. Well, that’s just about it. That is Kenneth Goldsmith’s soliloquy. Right. Yes. Yes. No well that, that was from, that was from all the reviews that I read and some of those, some of those were his words and some of those were the critics words – I-I, I Just nicked from wherever I felt that was interesting…yeah. Yes, yeah. Yes. Yes. Yes. Yes. Yeah. Um. Yes. Hmm. Hm-hm. Right. Yes. Right. Yes. Yeah. Yeah. Yes. And divide it up into seven acts and for seven days. Yeah. Yeah. Right. Which reminds us that we’re all constructed…But makes us think, makes us think about, but makes us think about, what constructs us or how we’re constructed or how we relate to others or to how we look at language, umm, it takes it back to language itself…I mean but we, we, we very rarely ever put language under the microscope to the extent he does…I mean he has said it actually has changed his way of hearing himself talk…and hearing other people talk, um and certainly I mean - you can’t help but do that if you subject yourself to a week of that sort of intensity…So where are we going to end this Pavel? O.K…that’s fine, yeah. Well, it’s been very good talking to you…o.k. Brilliant…have a good trip to Vienna. Take care Pavel and thank you very much. Cheers, bye. Hello. Oh, hi…uh-huh. That sounds brilliant. I wonder if, uh Kenneth Goldsmith also kind of practiced and prepared himself so well, you know. You’re kind of reversing the tables aren’t you? I’m becoming a, a sort of instrument in a kind of attempt to divert or water down a written text here. Well sure, I’m very happy to do, you know. Do you want to throw me a question…you are supposed to be interviewing me. Um-hm. Um-hm. Um-hm. Um-hm. Um-hm. Um-hm. Um-hm. Um. Now that’s-that’s a long question if I have ever heard one. Uh, I think, what is sort of…not quite missing from your point but what kind of effects, ah, the argument is when you actually look at it from the receiving end, that is from my end. I have now listened for a good five minutes to a prepared text being read to me. Ahhh, I have somewhere near me the copy of, of Kenneth Goldsmith’s book, ahh, which I have read bits of, or which I can read. There is a difference between the way speech and writing operate at the receiving end. The, if you, if you see, ah, this work as a written speech, how do you then kind of see the reading of the book - as listening? Now, that’s an interesting point. You know, there was a time, ah, according to Marshall McCluhan at least and I’m sure others…where silent reading was an unheard of thing and he describes if I remember correctly, in Guttenberg Galaxy…ah, a monk who was reading silently, ah and er, crowds were kind of coming from, from far and away to see that kind of strange phenomenon of a man sort of reading in silence and watching how, according…that’s what, what Marshall McCluhan quotes in the book…how his lips were moving as though he was, uh, uh, ruminating the, the-the holy word or whatever it was that he was reading, you know and the idea of the separation of reading from listening, from speech, yeah, from the transmission of, of-of speech really needs to be somehow made part of that argument. The-the, yeah, you go…Umm, a question you call it, ah…yeah…it’s not really a question, I mean it’s a sort of…you know, uh, uh,…to comment on this, there is – it’s a difficult, uh, uh, position to agree or disagree with or even sort of add to because basically, uh, what is happening there - you are sort of reversing, ah, in some ways a kind of a performance which is, which is registered in the book or in the work. What happens in the book, is that a guy has an idea and decides to do it. It fits within what he, ah normally does, both conceptually and technologically. You know, he is used to the idea of say, e-mail – he seems to be, you know…I hardly know how to spell e-mail…but-but but he seems to be obsessed almost with it - its one of the kind of core activities that he does – he does websites and so on which are, which are, are technologies of absence, if you like, you know, ah, e-mail - we, we talk about actually talking to someone or visiting a website yeah we don’t go anywhere we don’t visit anything, we sit on our bums - ah, do something with the computer which kind of completely passes me by, I’ve never seen a web site – I don’t know what they look like and then, you know, suddenly we are visiting something, you know…something is actually visiting us but that’s a kind of difficult thing to grasp…so the metaphors around that technology are constructed, in a kind of, they kind of refer to a kind of lower order of things – or more basic, more experiential, more everyday, more physical, ah, more kind of universal order of things, you know, speaking, talking, visiting, yeah, going somewhere, you go to such and such a website. Now, so, so he, uh, uh, decides to make a work which fits what he does and decides not to do anything else than what he does that is to just normally live, then, ah, uh the trick is that he will leave the world sort of – if you like out of it, ah, put his part of it, code his part of it in writing which is the kind of higher order of things, you know - the abstraction, remove it from the, uh, from the reality of things, of the world and pass it onto someone like you or me you know to bring it into our world of things - it is just an object, it is just a book, which is going to sit on my shelf next to other books and so on and uh, and uh, ah, ah and leaves us, kind of, to, to put in the kind of missing bits in a way he is, when I read it, he is kind of, in the - in the kind of sense of the e-mail technology for instance, he is talking to me, you know…I am the one who is in those, sort of, empty spaces, in those empty gaps…he is always talking to me or he is talking to someone, someone just next to me, you know…Yeah, which you would, which you would, which you would never, for instance conventionally find, ah in a novel but in some sense every novel, every dialogue in a novel, you know. Barbara Cartland always speaks to the reader, you know and every artist, ah, even when the artist may not be using, ah, the kind of form of-of, well ostensibly it is really the form of a novel or something close to it, ah, every artist is a storyteller - so every artist anticipates, every artwork anticipates a kind of listener, you know, a recipient who is there as you speak, who is there as you write or who is at least there as he or she reads, or looks, yeah…what I find kind of strange here is that whilst, you know, the whole kind of methodology, the whole process that he, that, that Goldsmith uses is really in some ways pretty conventional, and pretty kind of, you know, basic and simple, unembellished maybe, unsophisticated maybe in some ways, located in the everyday if you like ah, ah, there is a strange sense that there is something kind of missing from, from those conventions of the reception at the receiving end so for instance I can kind of, and I caught myself doing it while I read it, ah -I can kind of imagine the people he is talking to and you know, sooner or later, I’ve not read the whole thing through, but-but sooner or later you come across certain kind of traits and traces of people and you kind of get to know them as you would in a novel, yeah, in a well constructed novel or, or, or in a movie, but, but they are never really completely quite there, you know. Its like if you were sort of blindfolded or something you can’t really quite see what happened to them from one sentence to the next. You can’t really guess exactly where they are. It’s a little bit like, I saw on telly this amazing thing which I’m basically intrigued by, ah, a film called, something with Robert Redford, a film called…uh..uh…Legal Eagles I think, a few days ago. And I’m very much into the way Hollywood represents modernist art on screen and so I sat down and watched it and much of the film is-is taking place in a gallery and it’s all to do with fraud and murder and passion and all these kinds of things and the kind of absent protagonist of the movie is an artist who dies right at the beginning of the movie and whose work is the, sort of, bone of contention between, sort of various parties involved in some kind of legal argument and so on. And, and, ah, as the film progresses, you kind of get to know a lot about the artist, you get to know the, sort of, importance and position of the work, of the work, ah, ah - on the market and it must be a bloody important, marvelous work because at one point they actually use, what looks like Brancusi to smash to pieces a piece of plaster - just to get the work, you know, that they are after, so you know, so if it is worth damaging Brancusi for – it must be bloody good. But it, through out the film at no time do you ever see the work…you see people looking at it, you see the back of the canvas several times, or different canvases - you see people unrolling canvases that have been sort of, you know, ah, ah, ah, in a container, wrapped away, stored away and so on but you never ever see the work itself and it’s a kind of similar thing that is happening here, you know. Well exactly, and because you configure it mentally, you know what happens there in the film, you have a fictitious artist and the director was bloody smart not to do the thing that the rest of them do and that is to get the props technician to paint something like a, you know like a Pollock, you know, ah, ah, just to have, you know, an artist, ah…but, you know, use devices where you don’t really need to see the work but make it very, sort of, intriguing so here, ah, you are kind of getting something similar in reverse…there is kind of real life is being used so that through the conventions, of the, of the novel-like thing…text that you get at the end, you know, the chronological, sort of, developing novel like text made of, made of words and chapters, ah, you get kind of a fiction, you know, out of the, out of the, ah, sort of, real life story that is sort of, you know, definitely behind there. I mean, in that, that absence, is an absence of the real and yet the whole thing is trying to be nothing but the real. Um-hm. WeIl in a way you have to, because you have no one else to fit in there, you know, in a way you have to…I wonder what would happen if you read that text, sort of, out loud to a listener, you know, to an audience, you know, I wonder what would happen then. Ah, I don’t quite know, but, but, ah, really, the, the…when you are, sort of, on your own with the text, trying to negotiate it, the way you negociate…ah, you know, not even the way you negotiate fiction, even the way you negotiate a document. Say, I’ve never seen such a thing but say, you know, a, a transcript of legal proceedings or something, of court proceedings so even if you try to negotiate it that way you still have only yourself to fit in there, you know, and its kind of the insignificance of it, maybe - that makes it possible I imagine that, that, ah, you know, its something of relevance to you, true relevance to you, just like it maybe the case if you do read through legal proceedings somewhere, you know, ah, ah, ah – what’s referred to in the text that you would be, sort of in a different position and the text would be if you like, unmasked, I’m using this word incredibly carefully, unmasked as a kind of, only half of a thing, you know – its, it’s a way of kind of, I, I understand from the context that he trained as a sculptor, it’s a way of making a piece of sculpture by taking something away like in carving, you know, you have a block of stone and you carve bits away and you are left with a, with a sculpture. So you have a tape, which presumably, ah, had a lot on it, of other people’s words. They were all taken away and you get a piece of sort of text, sculpture, a piece of text/sculpture. But, uh. No, I give you a better one, I give you a much better one. Lets, lets get the history correct here. Lets sort the history out. Ah, Rachael Whiteread works in a kind of idiom which is a long history and to my knowledge, apart from Bruce Nauman, ah, ah the, the kind of, you know, pioneers of this idea are to be found in Croatia, a group called Gorgona in Zagreb in 1963 who proposed to cast the inside of their own heads, that is what he is doing, he cast the inside of his own head, you know. Umm, well he actually saying something there in the text, I like that very, very much, where, where, talking to someone, ah, he is talking about, oh I can’t, I forgot the word that he is using there, but about reducing the text to the smallest type size, that, that, you can reduce things to and kind of, seeing what happens. I actually like that idea very, very much, I kind of like the image of it, and, but, but I like it for another reason you know, I like the idea of making it, sort of, more complicated by not allowing, really any form of, of, of meaningful access to it. Because once you reduce it to a size which is below the threshold of what an eye can read. You know, we are presuming that people don’t use microscopes to, to examine works of art unless they are conservators or something. And so when you reduce it to that size, and kind of just do exactly what he suggests: see what it, see what it does; see what it amounts to; see what happens. You know, you move from reading to looking and you move back through that kind of whole process of what is art practice using techniques of, you know, sound recording and literary practice and writing - all those things that sort of traditionally are sort of marginal aspects of it or, or indeed in some peoples books, completely excluded of it. Ending up again with something which is basically like a kind of, I imagine, like a minimalist drawing or something which is like a Malevich, kind of, black square except it is grey on white, on white, white paper and I like that idea very very much but I’m also, I’m also quite happy that he didn’t do it , you know, its kind of a bit too clever, but, but I like the idea. Not concrete, cast them, cast them. Like Rachael Whiteread cast the house or like Bruce Nauman cast the underside of his stool and the space between two boxes. And they, in fact, its in a manifesto that they, that they issued in 1963 and they continued by sort of proposing to cast the inside of cars and everything and in the end they say, every relevant empty space in our city…you know, now, the, the, the, ah, ah, ah, the idea is kind of what is the relevant space sort of in your city? That’s a sort of, that’s what kind of gives it that edge and that’s obviously where the metaphor runs up against, against Goldsmith’s methodology because of course, he does not really, ah, ah, at least appear to be consciously seeking, kind of, relevant conversations, relevant situations, you know, what is, what is relevant? The relevant empty space is the accidental, sort of empty space that he comes across. I mean, you know it’s interesting, because he’s always responding, or mostly responding, he’s not kind of leading the way. It almost like, like the, this kind of interview we are doing right now, rather than being a respondent to your questions, I’m the misleader, you know, I’m supposed to kind of mislead you, take you and divert you, take you away and uh, and uh, uh he’s kind of doing something, something kind of similar. He’s not leading anything, you know, he’s responding but for me at the receiving end, he’s obviously leading me because I can’t go there alone and I have no one else to lead me. That’s it. That’s it, that’s it, that’s what it is. Mmm, no that’s, that’s, that’s what he refers to yeah, it’s the idea that when you get below the threshold of perception, you know, you see something that kind of, you know, ah, is not there, even in the first place the same thing happens, obviously the other way around. I used to re-photograph other people’s photographs from kind of printed images, from news images, blowing it up twenty-five thousand times, you know, until, until you really were getting something that was not there in the first place and of course there’s nothing that was not there in the first place. Its blow up, its Antonioni. Yeah. Um. It’s a kind of, you know, it’s an enthusiast speaking there. I wouldn’t quite kind of…beautiful as it is. I wouldn’t quite, experientially, kind of, confirm, confirm that it really is so. But, you know, if someone is boring, sort of, after eight minutes, they are probably boring forever. But depends what you call boredom, call boredom. But what is, but what is, what is really happening there. If you take Antonioni’s blow up. You never really know whether a murder really was committed and even if the murder was committed you never really know, ah, the details of the victim, of all these kind of things. All these things have to be filled in, on the basis, of what is not photographic evidence but a kind of photographic suspect, yeah? The photograph which is libidinous is turned into the photograph that is kind of metaphorically speaking, the suspect here on trial, yeah? And this is a similar kind of a thing, sort of, happening there. In a way, maybe, that the, the idea of using the micrographic principle and reducing it down to god knows what, ah, ah, maybe it is redundant, maybe that what he did in the book has already done it. Because, it is a kind of a different scale, you know, there is some kind of a different way of measuring in big inverted commas time and volume, you know a number of pages or whatever, you know. Is this a week of text? I mean, I like the thing on the back cover where he says that, that, ah, you know, if there was a kind of, snowflake for every word uttered in New York every day, there would be a snowstorm. You know, its kind of nice, it’s sort of like a zen thing…almost. Anyway, so, so there is a way of measuring these things somehow, you know, comparing them, you know. Is this the right kind of equivalent, is this the right kind of amount of words or volume of paper, or whatever for a week? And er, and er, ah, it seems to me that he has already kind of performed that kind of reduction, you know, or, or enlargement. I don’t know…but it’s somehow to me. I don’t know if it’s right. It’s up to every reader to decide. And maybe it is in that change of scale, you know, that there is already something of that happening, of that effect happening, something that was not there in the first place is already appearing, you know, because of the change of scale. Just as in the bit you read about the, the micrography, the Chinese characters is appearing there because of the change of scale or just as in my example of the blow up, you know, a, a pistol seems to be appearing in the bloody sort of shots there of a photograph, whether or not it was there in the first place. Something of that sort is happening here. Can I have some more coffee? He was, he’s talking, he’s talking about that, it’s not me. I can’t be credited for that. Um-hm. Um. Um. But, but, you can, sorry to interrupt, but you can anticipate. I mean, what is so weird about the experience of reading it is actually how predictable, if you like, the story becomes after a while. And that’s not because routines, because there are actually little accidents happens to it. He walks a dog and someone makes a racist remark and he, kind of is thrown back by that and so on, yeah. And so, there are kind of, there are kind of glimpses of real life. Obviously, you discover that the whole thing is kind of worked out in advance because even the most hardworking or busiest of artists does not quite get that much of art into your daily chores. Ah, but it becomes very predictable, not through the structure but through the response because we are so well trained to respond in one way and not another and the fact that it is the same person always responding to, to whatever the kind of a situation is. You know, one type of a person…Well, more than that, more than that, more than that, because we are getting here, we are getting here…life, a real life type of response. You know, I presume that he does not suspend for instance, the kind of career enhancement considerations that we all have to have in the back of our minds when he meets a literary critic, so, you know, he is, sort of, promoting his work at the same time as he is actually making it, yeah? And, er, and, and, and all these things are kind of, you know, learnt, sort of, patterns of, of, of action and behaviour. And somehow the, the diversity, absolutely, and the whole sort of culture…he, he several times kind of emphasizes or he actually mentions his Jewish upbringing, and, and, the political orientation of his parents and things like that and so, ah, you are getting a kind of, an image of a person with a kind of, like all of us, a limited range of responses to situations which are probably more diverse than what his responses allow us to kind of appreciate. In so far as we can imagine the stimuli, those situations, those kind of, voices he is responding to. Ah, we, ah, can, you know, imagine a different kind of a response, or a different kind of a pattern but equally restricted only because it’s what I would say in a situation like that. Now the kind of real life doesn’t give you these big sort of, dramatic moments, real life is unedited, just like the text is unedited, yeah? So, a horror movie – you can construct a kind of a logic of a, of a narrative which will provide certain stimulis, stimuli at certain moments. You will still get predictable response to them, scream to attack and so on, you know, ah, but, but, er, er in real life the diversity which is probably greater than in any movie ever attempted…is obviously much more subtle and only surfaces through a kind of multitude of responses: through speaking; as well as hearing and listening (or overhearing); through reacting as well as seeing others reacting and so on. You know and by, by constraining the, the, the presentation or the record to one voice, you are constraining it to one pattern of behaviour, yeah? No, I can’t imagine myself as his wife, frankly. Yeah, you have to, yeah. Um, well that is true, yes, yeah. I mean, it is interesting that, that you have to kind of, enter it if you like, you know, but the space that is left there for you to enter and for you to activate, maybe…or for you to kind of resonate, if there is such a word, ah, ah, or for you to resonate in, for you to kind of, breathe the speech back in to, the voice back in, for you to give voice to. Ah, it’s a space which seems to have been already somehow kind of constrained already a priori, by, by what appears to be, inevitably, a kind of, or what becomes, through, you know, the process of reading a kind of, predictable pattern of, pattern of behaviour, yeah? And, ah, and ah, ah, ah, it does something to me, that, that a fiction necessarily wouldn’t. Ah, it puts me in a position where, I, where I, become as you would call it, his wife’s voice or, or his dog’s voice or whatever. It’s quite, actually, interesting where he has, where you have situations, maybe that’s an exception from the rule, where you have situations where he is talking, ah, to a dog, presuming that his dog doesn’t really speak back. You know, where you kind of…it’s funny, do you have that space there, do you have that gap, is there anything really missing? You know, it’s interesting. Dog owners would claim that their pets speak. I used to have a speaking cat who did speak, actually. You know, like a parrot…yeah, he was like a parrot. He would just sort of…if you repeated a phrase long enough within a register that he could imitate, he would start, sort of, imitating that, that sound…it’s interesting. Anyway, so, so, ah, ah, but, I’m not, I’m not one of those who would actually really believe that the dog speaks for me as a reader, ah, you know, I don’t really know if there is a gap, if there is a space, if there is something missing from the record. Let me go back. Yeah. Well, that’s inevitable. That’s the sort of, you know…I mean, that’s the sort of condition of interpretation, isn’t it?. There are various modes of interpretation. Your mode of interpretation is different than mine, I mean or your, your, the whole process is different than mine. And, you know, you know, in classical semiological analysis, you, or semioligists distinguish between three different intentions which are all, ah, all part, all part of an analysis of a piece of text. The first one would be the intention of the author, which kind of, sounds obvious enough, ah, the, ah, the second one would be the intention of the reader who, ah, which sounds also reasonably clear and then you have the intention of the text itself which is the kind of problematic bit, you know and without wanting to sort of, do an impromtu lecture on the rudiments of semiological analysis, ah, what strikes me here is that the intention of the text, is, the kind of, you know, is…is, in some kind of, you know, in some kind of way different from what you are accustomed to in any other type of a text, you know and it’s not because the intention of the writer is any different. The writer is creating an experimental, for want of a better term, an experimental art work as distinct from a novel or a record or a document, you know an objective document or a kind of neutral, you know, supposedly neutral document and the reader obviously approaches it as such, maybe, but, but somewhere else within the actual text itself, there is something else that kind of wants to happen. You know, a different intention in the text itself. Now, I’m not sure if I understand how that is built in but I’m sure that the, the, the different intention on my part and different intention on your part as readers and, and the different instruments which we use to understand whatever it is that the text wants is actually part of it. I’m not actually asking what the text wants to do…you know, you are. But you are doing it by using means which, which may not actually, ever lead you to it. Because, because in some ways its sort of unprecedented, it’s a kind of what if text, you know? It is, it’s not unprecedented necessarily in terms of, of its position in kind of the contemporary history of experimental art or conceptual art or something like that but it is unprecedented in terms of textual analysis. You wouldn’t come across situations where you would analyse half of a dialogue, you know? And, is it really half of a dialogue or is it a complete text with nothing missing? Yeah, and if…or does it want to be, let’s, let’s say, does it want to be a complete text with nothing missing or does it want to be a half of a dialogue, or, or, one half of many dialogues or, or is it just a kind of link that connects different voices which have been left out technically speaking, but which are there, or are supposed to resonate there. Or what is it? Is it a whole, or is it a half or is it nothing? It could even be nothing in some ways. Yeah, I mean if you, if you, if one wanted to use that kind of language. I’m not terribly kind of good at that particular language but it’s a little bit like, as you know, I collect found gloves, yeah? What I like about it is that, when you find one glove, you have found nothing because the pair is still missing. Gloves come in pairs. I like the idea that I have found something, ostensibly, I mean I have the thing here - I can show you, I can put it in front of you, I can put it on my hand or whatever and yet I’ve found nothing, yeah? And, in fact, the lost thing, which is the pair of gloves, yeah, ah, ah, is even, in some ways, more lost than before I found it. Because no one will ever get back, you know, unless you kind of, go and sort of, you torture me, I’m not going to give it back to you. So, in some ways, it’s even more lost than it ever was. Or I might find it in Tokyo and take it with me to Manchester, you know, it doesn’t matter but it’s kind of more lost. Now, this is it, I mean, you know, is it, you know it is something, it is a text, but maybe it is kind of in some ways is nothing. As part of a dialogue, it’s no longer, or dialogues, you know, it’s no longer what it is. It’s really beautiful in that respect, isn’t it? Um-hm. Hm. Um-hm. Um-hm. Hm. Yeah, I mean, you know, yeah. I thought of something else actually. Sorry, I wasn’t probably, kind of listening attentively enough to what you were saying. But, you know, what is interesting, you are quoting me people who are quoting other people. You have just read now, a passage from someone who quotes Goldsmith, you know. We are actually four people speaking here, yeah, four people speaking here. Or, or, ah, even more, we are three people speaking, me, you and Goldsmith via the recorded interview, ah, and two people on top of that writing, you are hearing a double because you also write, you have written what you just read, you know, and you have, written is quoting a writing of the person who interviewed Goldsmith so it’s kind of maybe six or seven people even, sort of, involved here some write-some, some speak-some talk. And, ah, ah, at the end of the day, if you do it the way you want to do it, ah, you know, separating our kind of little exchange, here again into its components, yeah, ah. We will have basically have performed the same trick that, that, ur, Goldsmith performs and the extremity of it, the extreme in it, you are talking about extreme writing now is not, I think, so much in the kind of, you know, in the, in the way you push the language at the point of writing but at the point of reading, you know? Which was my starting point really. But, but I think it is at the reading end that it becomes, sort of, extreme. Um. Um. Um. Um. Um. I wouldn’t quite know it’s always overwhelming, but, or in what way, but, er, er…yeah. What I find a little bit funny on what you just performed there, ah, is that, is that you performed, you performed a piece of his text basically. Now it’s a piece of his text, or was it his, was it quoting from him? Oh, that’s alright. O.k. O.k. O.k. You performed, you performed, performed a little sort of eulogy constructed out of other people’s sort of, ah, ah, ah, remarks about the, about the enterprise. The text, as you present it, doesn’t matter who the ultimate author is, ah, ah, is the kind of text which really tries hard. It’s very kind of written, it’s very kind of written text and in a way, when the whole thing becomes a book, it becomes that kind of text that is trying hard. But, it’s trying hard, ah, ah, it’s trying hard to overwhelm, if you like or, you know, or, to, to, to assert itself maybe. Now, I’m not sure what those means are. I’m not sure if it’s the clever idea of it, I’m not sure if it’s the extremity of it. Yeah. Ah, I…feel that where the sort of, wherever the trying hard resides, I’m becoming part of it as the reader, yeah? It’s sort of, you know, my inability maybe, or my unwillingness to dismiss it, my curiosity, my own habits, my kind of, you know, not knowing exactly what to think or do, or where to find what I’m looking for, or even what it is that I’m looking for. You know, that becomes the part of the trying hard. But in some ways, at the end of the day, what you get is a text which is a, sort of constructed thing, yeah, a construction made of language on paper which allows you to talk about, about, sort of, text as sculpture or whatever it was that you quoted there. Yeah. Text sculpture. And like the written text, the text written with the intention to be read and taken seriously, to overwhelm, to impress, to, to, to, you know, to provoke thought or whatever. It is as text trying hard. At the same time, if I detect any trying hard in my sort of, attempt to imagine the, the, ur, the origination of the text, which is the kind of, which is the voice, recorded in a situation, ah, ah, on the tape. The only trying hard I can detect there is trying hard not to try hard, you know. It is trying hard not to do exactly what, what the piece of text, you just read is doing and what, at my receiving end, ah, ah, Kenneth Goldsmith’s text is doing as a text, as a, as a book, as a kind of piece of reading. That’s kind of an interesting, that’s kind of an interesting condition maybe there. That, ah, at the end of the day, when you do get a text as literature, and it is literature because it cannot really be anything else, you know. Ah, ah, there’s no escape, from this sort of idea. The thing does not just sort of happen, does not just sort of come out of, you know, of, sprout, sort of, sprout, sort of somehow almost by itself from the speaker’s subconscious but is constructed and even if the process of construction is very, ah, unorthodox, that kind of sense of the thing being sort of, carved out, as I said before, ah, for me as a reader is still there. It may simply be that i’m so kind of limited that I cannot really, quite breathe freely, facing the authority of a book. It may actually have something to do with the format of the book. It’s quite sort of interesting that the, that the format of the book is really conservative, scientific journal like type of layout of the text. I wouldn’t quite call it classic. But really, very kind of, on the one hand really neutral, in quotes, and on the other hand a very sort of loaded presentation. And that sort of maybe, just for me, gives it some form of authority that I’m unable to completely ignore, you know. But, even allowing for that I do feel that there is a, sort of, kind of evidence in it for me, or sort of reminder, not evidence, cross out that word when you are transcribing the tape, ah, ah, there is a sort of reminder that, ah, ah the text cannot be anything but a construction, but a thing that is actually, sort of, consciously constructed. Well, in a sense…yeah. In a. Um. Um. Um. No, it would, yeah. Um. Um. Um. Well, you can end it right here. Yeah. Alright, well, I’ll put the tape in the post to you. Yeah, it’s been good. O.k. and I’ll get in touch or you’ll get in touch when I’m back. I will. O.k. O.k. Bye now. Simon Morris is a lecturer and a practising artist whose work includes the bibliomania project, interpretation and The Royal Road to the Unconscious. He has exhibited across North America and Europe and is completing a PhD at The University of Leeds. His work can be viewed at www.informationasmaterial.com.